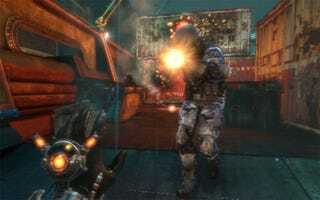 Activision had a playable version of Raven Software's recently delayed first-person shooter Singularity at Comic-Con. It was our first chance to test out the game's Time Manipulation Device, plus put a few bullets in anyone who crossed our path. The Comic-Con demo didn't spend too much time focusing on Singularity's sci-fi story line—probably for the best, given the noisy environment—instead dropping us about an hour and a half into the game. At this point, protagonist Nate Ranco already has the time shifting glove that gives Singularity its core mechanic, letting the player revert and age objects and enemies. That mechanic comes in handy for puzzle solving and offensive attacks, making Singularity a more strategic, puzzle heavy shooter. Singularity is a first-person shooter set on a mysterious island known as Katorga-12 home to a series of Russian experiments involving "Element 99," the element that powers that time distorting glove Ranco wears. We played through a 15 minute long segment, shooting bad guys, solving puzzles and watching some of the game's time warping cinematics unfold. We experimented with Singularity's time manipulation glove, played with the Chronolight—a device that lets players see objects that exist in different time periods, then pull them into Ranco's present—and poked around with some of the game's firearms. The game was due to be released this Fall, but was pushed back to the first quarter of 2010. The playable demo was indicative of a mostly complete product, but Raven Software reps said they'll take the extra time from the game's delay to polish the title further. Our Familiarity With The Controls: Raven packed a lot into the control scheme, which took a little getting used to. Gunplay is standard stuff—fire with the right trigger, sight or zoom with the left trigger. The game pad's bumpers are used to work the TMD, which can initially be awkward, especially when one is trying to use the time glove to decay a barrier an enemy is hiding behind while also returning fire. We're presuming the learning curve will be less steep in the retail experience, as players won't be thrown a full arsenal from the get-go. The Shootin': Capable stuff—not too surprising, considering Raven's experience with first person shooters. Gunplay felt solid, with a nice variety of machine guns, shotguns and pistols. There's even a pistol that fires Element 99 rounds, letting the player curve their shots. The TMD can also be used as a weapon, with rapid impulse bursts that push back enemies and a time revert function that pits enemies against each other. The Graphics: Most of Singularity's visuals are dark, gritty and moody. But there's a splash of color peppered throughout, with ghostly blues and oranges helping to break up the deserted environments. Singularity's mix of futuristic and Cold War era settings makes for a nice mix. The Puzzles: There's some really clever stuff in the demo alone. At one point, we were blocked by a set of concrete stairs, which we had to degrade with the TMD's age option. But then we need to get up those stairs, so we pointed the glove at the rubble and rebuilt them with the revert function. The Chronolight also came into play, with the demo requiring us to pull a platform from the past into the current time, filling the gap in a broken walkway. Singularity's move into next year is a disappointing one, because the mix of shooting and puzzle solving makes a relatively interesting shooter a potentially fascinating one. It's going to take some getting used to grasp some of Singularity's time shifting puzzle solving tactics, but we look forward to strapping on the glove again soon.